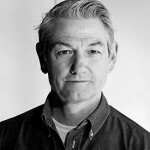 Gerry Davies is Senior Lecturer at Lancaster University and an artist who writes on drawing. He is ‘less interested in what drawing is, more interested in what it can do’. His work seeks to get a better understanding of how and where drawing today is engaging with subjects beyond the arts, in for example, science, medicine, and anthropology. In the future someone will scuba dive over your submerged house, they may even tentatively venture in to marvel at the baroque tangle of your snail encrusted living room, as they do classroom images of life before the Anthropocene with flood back. This proposition underpins an exhibition of drawings at Drawing Projects UK. Flood Story by Gerry Davies takes speculative thinking about global warming and rising sea levels to extremes. 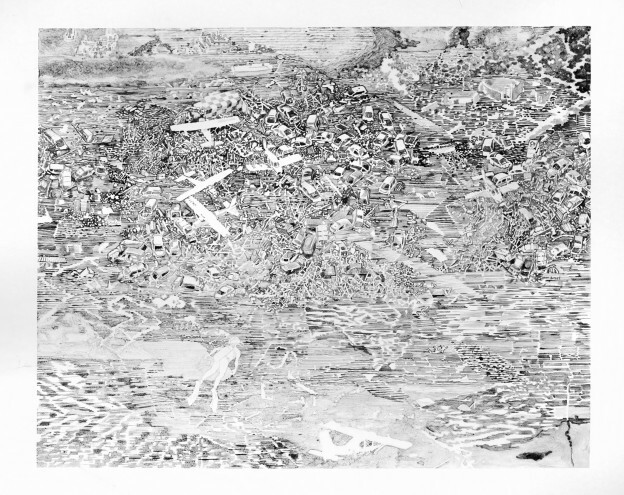 His drawings imagine environments so submerged, tangled and lost to us that they can only be visited by scuba divers. 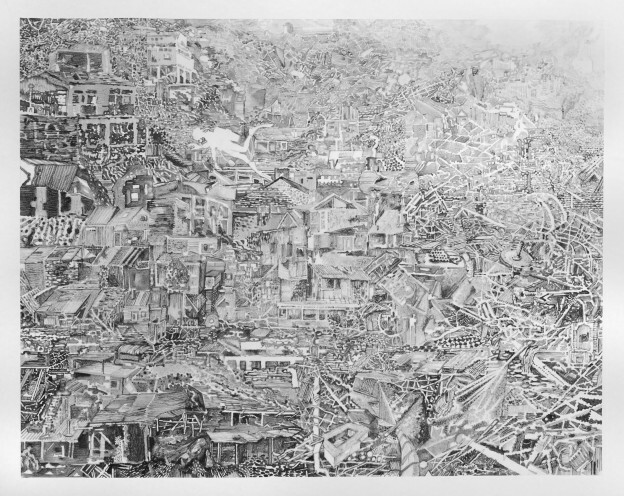 The drawings made in a silvery mix of graphite and varnish depict interiors, villages, towns and cities smashed and flooded. Banal 21st Century objects – clothes iron, bicycle – are silted down to become future fossils and archaeology. For us, today, inundation events on this scale are in the far future, yet when viewing these drawings the feeling is of looking back into history and a record of the past. Through this sense of a shift in time they suggest we, and the divers, have been transported forward in time to look back at the remains of our environmental folly. Gerry Davies is Senior Lecturer at Lancaster University and an artist who writes on drawing. He is ‘less interested in what drawing is, more interested in what it can do’. 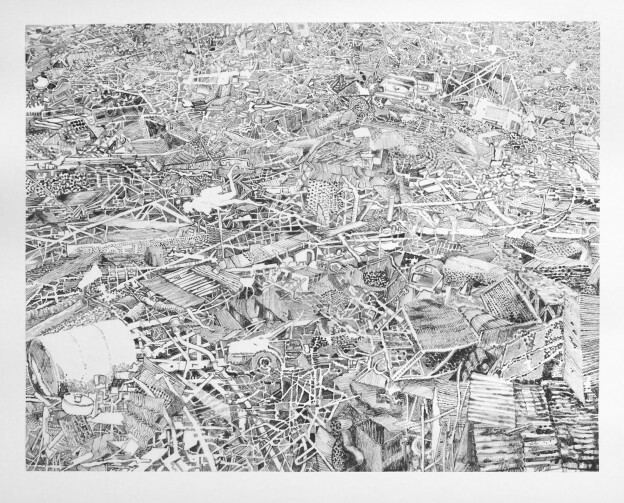 His work seeks to get a better understanding of how and where drawing today is engaging with subjects beyond the arts, in for example, science, medicine, and anthropology. 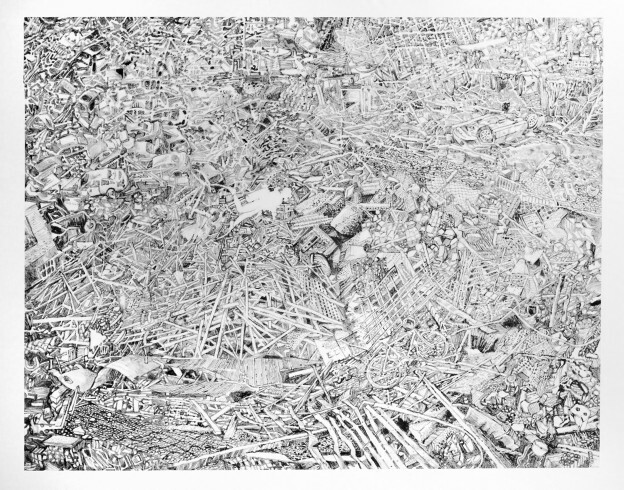 This extends to his drawing practice which has recently seen him drawing geology deep underground in Yorkshire and Australian caves. Drawing Projects UK (DPUK) is a centre for research, development and production of drawing and contemporary art.Programmes include exhibitions, drawing sessions, projects, workshops and seminars that explore the role of drawing in creative practice and all its possibilities. The centre includes a dedicated project space, gallery, studios and workspaces, forming a creative hub for the exploration of drawing through practice in Trowbridge, Wiltshire, UK. 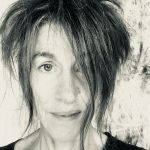 The exhibition will be accompanied by an illustrated publication with a foreword by Professor Anita Taylor, Director of the Jerwood Drawing Prize and founder of DPUK, and an essay by Professor Nigel Clark, scholar and writer on the Anthropocene and conceptions of geological time and the body.